Pest description and crop damage Adults feed on the leaves, causing a ragged appearance. Adults are 0.5 inch long, gray to black, with narrow and elongate bodies and conspicuous heads and necks. The pronotum (the segment that covers part of the thorax), when viewed from above, is narrower than either the head or abdomen. Larval blister beetles live in the soil in uncultivated land and are predators of grasshopper and bee eggs, thus they are more prevalent next to CRP or fallow areas. Adults feed on the foliage of many different plants. Occasionally, these beetles can cause complete defoliation of affected areas, but because they are extremely clumped within a field, little total damage normally results. If control is required, only spot treatments may be needed. insecticidal soap-Some formulations OMRI-listed for organic use. pyrethrins (often as a mix with other ingredients)-Some formulations are OMRI-listed for organic use. Note: Pyrethroid insecticide (Group 3 in Tables 1-2) applications can lead to outbreaks of aphids, thrips, and spider mites. Chemical control of blister beetles in potatoes is rarely required, and spot treatment of affected portions of a field is effective. 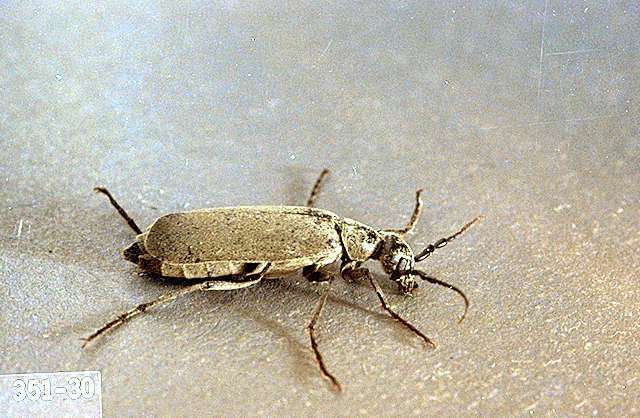 There are no known economic thresholds for blister beetle management.